As an IT professional who is required to read a significant amount of technical documentation on a daily/weekly basis, I believe this course is a great tool for improving your performance and staying on top of the information that sometimes becomes overwhelming. The course not only addresses speed reading but how to prioritize WHAT you need to read. I have been an attorney for 33 years. In my field a lot of reading is required. I have struggled all this time because I was a slow reader (agonizingly slow) and I have dyslexia. After taking the Rev It Up Reading course my reading speed and comprehension increased dramatically. Even though I took the course about a year ago, the lessons I learned continue to improve my reading speed and comprehension. My only regret, and it is a big one, is that this course was not available when I was in law school. It has radically improved the quality of my life, both professionally and personally. If you are concerned about your reading ability, do yourself a favor, take this course. The only thing you have to lose is your slow reading and low comprehension! This course answered lingering questions I had about my reading ability, and gave me the opportunity to combine techniques to really ‘get’ speed reading for the first time. I will never forget the feeling of finally being able to fly over a page and understand it at the same time. When I began (the Rev It Up Reading online course), I had in mind that my reading speed would increase, and it did – substantially! What I didn’t know and what truly surprised me was that the ease and pleasure in reading increased very much. The course – the exercises – the support and Abby’s willingness to just help is truly above and beyond. Thank you! I took some time to practice on internet articles between lessons and that seemed to help burn in the techniques and got a 3x speed increase. The information is presented clearly and concisely, with frequent opportunities to try strategies and track results. I found several strategies that are clearly increasing my reading speed. Highly recommend. It’s never too late to improve your reading habits. Easy, convenient and value for money! This is the kind of course that will get your reading abilities from good to great, from great to excellent. I’m excited by the prospect of all the great reading I’ll be able to cover with the tools this course has taught me! Now excuse me while I get back to reading! I’m about to start grad school in the fall. I’m also studying for several technical certifications. Technical certifications require much more of a reading investment than most people could imagine. I’m always looking to improve my lot in life and I’m an avid reader. However, studying and working can be tough and I needed an edge. RevItUpReading is that edge! One of the best courses to introductory speed reading. Will effectively increase your speed to multiple times your current rate if you apply it. Abby, Thanks for putting this material together! I always thought speed reading courses were gimmicks, but I’ve been wrong for years! You’ve shown me how to preserve the world’s most precious commodity – time. I’m looking forward to continuing to strengthen the muscles and skills I never knew I had! Thanks so much! I was completely shocked at the results I got from this course. I’ve increased my speed and comprehension materials and now I’m not afraid to go back to college armed with this information! Thanks Abby! Great tips if you want to learn to read faster and to remember more of what you read. I liked this course. It was concise, interactive, informative, easy to follow, and also just plain better than all of the other software, courses, videos, and articles that I have encountered. I love that this course teaches me new strategies for reading that I have never been exposed to, despite years of schooling. I only wish I had this course years ago! I am looking forward to teaching these strategies to my kids as they grow older. It’s not just a speed reading course, it is a comprehensive package to keep you motivated and stick to your learning goals. You just have to TRY IT! There is no better way to explain the benefits of this program it will help your focus, comprehension, speed and a large boost of confidence. This program helped me read better and increased my ability to follow through! I HIGHLY recommend this program for EVERYBODY, Knowledge is power and reading is an excellent way to obtain knowledge! This course was a fulfilling, productive, and exciting way to spend time during the summer! This course has changed me for the better as a reader!! I now finally enjoy reading!!! This course is a must do for students who struggle with slow reading and low comprehension. It is full of easy but effective techniques that will make reading much smoother and faster and also more enjoyable. This was a great course. It was very informational while still fast paced. I feel like I gained a great span of knowledge on how to better the amount of reading I have to get through on a weekly basis. A source that will truly ‘REV’ up the engine of your brain for a high quality learning experience! Rev It Up Reading not only increase my words per minute and comprehension, but showed me a different outlook towards reading. Thank you! I will teach this course to all of my friends and family who share in my love of reading! Rev It Up Reading helped me overcome my slow reading habits and doubts as a reader. I am now a better, faster, more confident reader after completing this course, and I feel I can handle any reading material that may come my way. This course changed the way I approach the biology textbooks, I know much better ways to approach them now. This course is extremely easy to use and more than doubled my reading speed and boosted my comprehension in just a week! An exemplary course for any student looking to decrease their time spent reading and on homework. I thought that reading slowly meant deeper reading. I was definitely a “talker” when it came to reading. At the end of course, I easily tripled my reading speed on computer screen, while maintaining my comprehension rate. Over tripled my reading speed and gave me the confidence to read when I don’t have to. I thought your course content was excellent. I actually have looked at a lot of the research mentioned in your course on speed reading and had tried to teach myself. I bought the 7 day course to compare what was in your course to what I had come up with on my own and found yours to be great for a couple of reasons. 1) it was based on sound principles. Some courses out there are based on crazy concepts. Yours is realistic and easy to grasp. 2) Your course doesn’t make unrealistic promises. So many courses promise 5,000+ wpm. These are really just effective skimming methods which may help someone who is very behind catch up on general concepts in reading, but don’t really help with “fully reading”. Your methods allow a student to read quickly without sacrificing understanding in the long term. 3) The variety of exercises you offer are excellent. Through my own study of speed reading and science behind accelerated learning, I had come up with 1 drill that I used repeatedly. It worked well, but got boring and my compliance with it would slip. The variety of exercises you present left me with many options that are exciting. Thank you for your course. I’ve checked out many and, for the time and cost, it is the best I’ve seen by a WIDE margin. I did not know it was possible to increase one’s reading speed. I thought I was stuck at a low level. I went from frustrated to excited and confident about my reading! I wanted to let you know that my daughter took the online Rev it Up reading course and improved her reading grade on the ACT from a 26 (Feb 2015) to a 34 (April 2015). I would highly recommend the course. I look forward to continued practice and solidifying the gains I have made in speed/comprehension. Thank you for providing such an excellent resource! Your course has made a meaningful difference in my life. God’s honest truth! 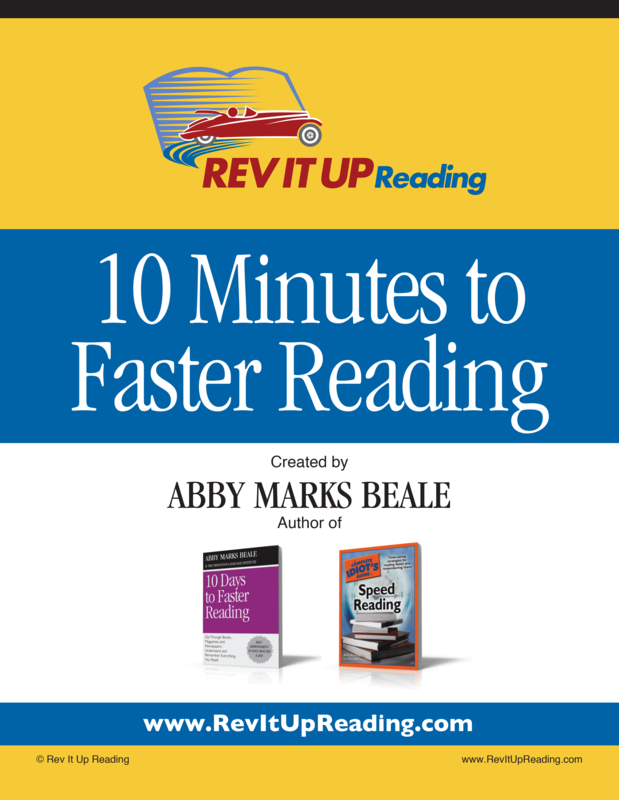 Rev it up reading is amazing, it helped me with comprehension AND speed. I would certainly recommend it to young, old, friend, or stranger! I just wanted to let you know that your program is AWESOME! My daughter (age 16) was having difficulty on the reading section of the ACT. While she is a good reader, she still struggled. She has taken the ACT several times and her reading score was always around 27. This summer I purchased your program for 90 days. Well yesterday we got her test results from taking the ACT earlier this month. Her reading score was a 35. When she came home from the test that day, she said she had enough time to actually go through the reading test twice. I am telling everyone I know that if they are looking for a speed reading program, that Rev It Up Reading needs to be their only choice. Thank you!! Yes, I would recommend this course to any students who have to read a lot, and to colleagues who feel bogged down by reading.